Parrot Flower -- also known as Parrot Plant -- is an exotic flowering plant native to Brazil. H. psittacorum is a member of the banana family. Its huge, deeply veined green leaves grow along narrow vertical stalks. Tall, upright stems carry spectacular orange and red bracts with yellow-to-orange flowers, often tipped with dark green. The flowers look like a parrot's beak, giving the plant its common name. Many cultivars are available to choose from. 'Lady Di' is a long-time favorite with dramatic red-orange bracts and creamy yellow flowers. Orange-red bracts with orange flowers make 'Andromeda' a popular selection. 'Choconiana' is a dependable bloomer with orange-red bracts and orange flowers. Variegated foliage and yellow-and-red bracts make 'Parakeet' an exciting new cultivar. A prolific bloomer, you can expect exotic flowers repeatedly in spring and summer. 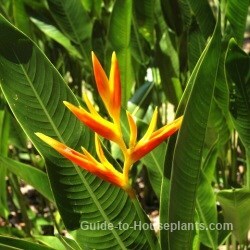 If your Heliconia plant doesn't bloom much, it's not getting enough light. 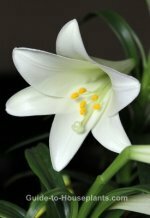 Move your plant to a sunny window or sunroom or put it outside when the weather is warm. It'll be fine as long as the temperature doesn't dip below 55°. Cut off spent flower stalks to encourage more flowers. Repot in spring every 2-3 years or when your plant outgrows its pot. Use a large, heavy container to prevent toppling -- this plant can get top-heavy. Low air humidity may cause brown scorch marks on leaves. Mist a few times a week with room-temperature water. Misting also helps to prevent spider mites that love dry conditions. Watch for their webbing between leaves, a tell-tale sign of an invasion. Light: Bright light to direct sun. Heliconia sp. needs bright light to bloom. You can move it outdoors in summer to give it the sunlight it needs. Remember that it may need watered more often if kept outdoors. Water: Keep soil evenly moist year-round. Do not allow soil to dry out. Humidity: Moderate to high humidity (50-60% relative humidity). Take a look at these easy ways to raise the humidity for house plants. Temperature: Average to warm 65-80°F/18-27°C days. It will tolerate nighttime temperatures as low as 55°F/13°C. Soil: Peat moss-based potting mix, such as African violet potting mix. Fertilizer: Feed every 2 weeks in spring and summer with a 10-10-10 liquid fertilizer diluted by half. Do not feed in fall and winter. Propagation: Divide rhizomes in spring and pot separately.